I drank this wretched concoction and then spent the next 59 minutes willing myself to not throw it up. I was grandly successful, as was the brilliant blood taker in getting my vein in one try. (A rarity...) I wish I could have looked at it as a nice little vacation from life. Just my magazines and I. But my near constant, awesome, nausea had other plans. I chose to forgo the parking garage ($4 an hour) and parked at the adjacent mall for free. 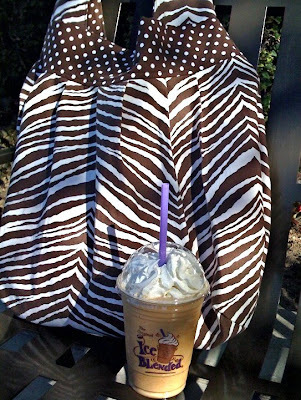 Mostly to justify getting myself (and my zebra purse that can hold six magazines, my composition book, and chunky wallet all with room to spare) this glorious Pumpkin Ice Blended. Worth every single gram of sugar. Take that glucose tolerance test! Also, to swing by Children's Place to get some new zipper pajamas for my little stripper. Thanks again for the tip! Finally non-fleece zippys in her size for a great price. I also have a bit of trouble passing by a Gymboree clearance rack. I bought the little one her first dress. Watch out summer. Watermelon girl is going to be crazy cute. To top the day off, during naptime I finished 15 purses. I am feeling pretty much like a sweat shop worker lately, but pleased with the progress none the less. way to go sweat shop worker girl!! I LOVE the zebra one on top of the left pile!! Love the little watermelon dress!!! glad you got that awful blood test out of the way!! thatwas the dreaded one for me!! Blech. I just had a preganacy flashback! Ugh. Love that bag, though. I am on the prowl for a good fall bacg that will hold at least two notebooks. No luck yet! Cute stuff!! I never could figure out the purse(dummy me) but pop over to my blog to see what I did make. I was pleased with the end result. You made me really tired just reading about your day! Good for you! 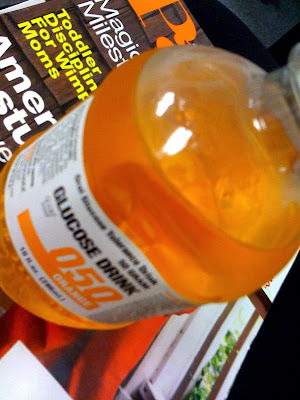 Just looking at that bottle of orange glucose liquid made me throw up in my mouth a little. Seriously, I prayed about it..."God, I have this fabric already cut, what am I going to do with it??" I did see something somewhat similar that one of those famous fabric maker/pattern creator bloggy types made but had not the time nor the money for the pattern. It was actually easy once I knew what I wanted to do. Those signs are so fun-I can see why you make so many!! Thank you for the inspiration!! I agree, I am tired reading about your day - you worker bee, you. I want a purse - are those going to be on esty any time soon? Ughhh! The dreaded orange drink!! To add to my enjoyment after forcing that thing down with my last pregnancy, the girl directly to my left in the waiting room wasn't as lucky in keeping hers down. Love your zebra purse. Hate the glucose test. You accomplished A LOT today!